21st March was the Parsi New Year. Parsis are Zoroastrians who worship the sun God. They are originally from Iran. They came to India centuries back to escape religious persecution, well before there was George Bush to save the world. They have since then become a part of Indian society and have contributed to various fields. Some famous Parsis who came to mind are the Tatas and Godrejes in business, Zubin Mehta and Freddy Mercury in the world of music, Boman Irani in films and the wife! So now you know about my special interest in this quaint, though dwindling, community. The last couple of days were a Parsi food festival given the new year clebrations. Uncle J, a very close family friend, took us out for dinner to Bombay Yacht Club on New Year’s even. 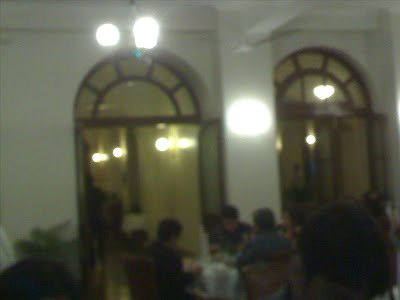 The Bombay Yacht Club is this awesome place from Colonial India. It is all wood – the floors, the staircases, the doors. The ceilings are high and it even has a ball room. In fact we had dinner in the ball room this time… and I could quite imagine it as a discotheque from the days of ‘Pride and Prejudice’. I wish I was carrying my camera. The place is really awesome. I was in half a mind to address the wife as ‘m’lady’ through the evening. Parsis are traditionally supposed to be jolly, boisterous folks who enjoy the good things of life. Uncle J’s table lived up to it this night. Apart from the three of us, our table had one of uncle J’s young sailing friends, a close friend of the wife and another close friend of the close friend. And boy was our table a merry table or what? 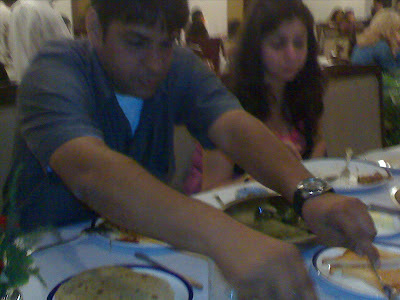 And the food lived up to the reputation of the famed Parsi cuisine. Forgive the photographs though, I took them with my mobile phone. We had a lovely ‘almond soup’. This was the only non Parsi dish but was extremely creamy and had a certain warm, motherly taste to it. Uncle J and I loved it. We had akoori on toast. Akoori is a Parsi scrambled egg. The texture is soft and it feels very good as you roll it in your mouth. Interestingly it has got Indian spices which give it a slightly yellow (from the turmeric) colour. The taste is slightly spicy in contrast to deceptive softness of the egg. Very tasty indeed. We then had the Chicken Farcha, which is the KFC of the Parsi world – chicken pieces deep fried in an egg better with a subtle spiciness. The wife said that this was one of the best farchas that she has ever had. We also had traditional Irani cutlets and gravy. The cutlets were very nice. 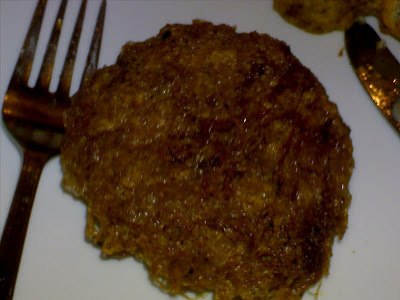 The mince inside was one of the softest I have ever had and could give the Galawati kebabs of Lucknow a run for their money. They were definitely the best Parsi kebabs that I have ever had. The famed ‘Patrani macchi’ followed. 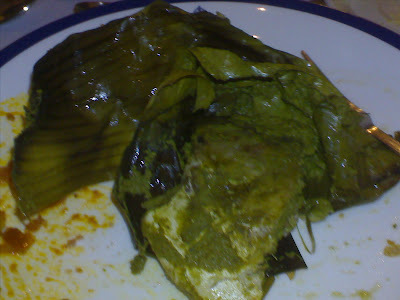 This is essentially pomfret steamed in a banana leaf with a green coriander and coconut marinade. Unfortunately the one at the Yacht Club was a bit dry. Plus I am partial the Bengali Bhaapa eelish (steamed hilsa). Still the ceremony around opening the leaves and serving the fish added to the fun. Uncle J’s friend did the honours here. We next had ‘Pulao daal’. 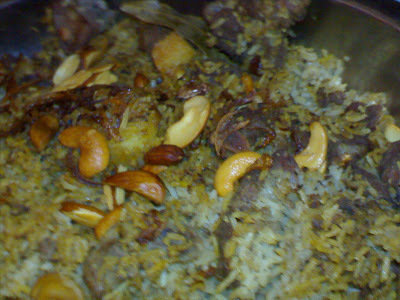 This was a dry, rice pulao which had dry fruits and meat in it. We had this with the traditional thick, brown daal. This was quite tasty too though I was quite full by then and wished that I had an extra stomach. 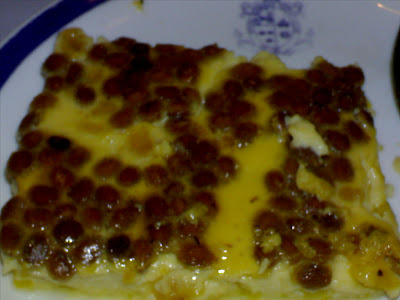 We ended the dinner with the delectable ‘laganu custard’. This means ‘wedding custard’ and is served at weddings. This was a sweet, soft pudding and again tasted better than the custards that I have had at Parsi restaurants such as Jimmy Boy and Snack Shack. 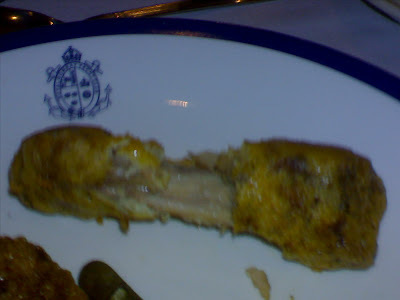 We have had many wonderful meals with Uncle J at the Bombay Yacht Club but this definitely was the best. This was probably because it was flavoured by the famed Parsi hospitality. I’ve got a couple of more posts to write about our new year celebrations. But I need to make lunch (pabda curry in mustard) now. So more later. even as i read this, I'm munching on another parsi delicacy - chicken cutlets!